I don't know where the time has gone, but I've worked in the online recruitment sector for nearly 15 years!! During that time I've been asked to share hiring tips countless times. The funny thing is, if you were to ask me today what hiring tips recruiters should be reading up on again now... the answer would be the same as it was a decade ago - figuring out how to write the perfect job advert! Of course so much has changed in the last years. LinkedIn, social recruiting, employee referral schemes... technological advances have made these elements and more an important part of a modern recruiting strategy. But underpinning them all is the ability to write the perfect job advert. So let me share some hiring tips with you, looking firstly at what your job advert should be achieving... and secondly at 5 things you can do to make sure those goals are indeed achieved. The most suitable candidates are those who will go through the interviewing process and - after everything they've learnt - will want to join your company ahead of any other employers they may be considering. The most suitable candidates are those who will fit into your company and will be happily and successfully employed many years down the line. If your job advert attracts lots of candidates like these, you will be living under the false pretence that your hiring campaign is going well and that it's only a matter of weeks until a great new hire is made. A great candidate is only a suitable candidate for your opening if they are applying in full knowledge of all the facts. Otherwise they are just a great candidate who has been deceived into applying! 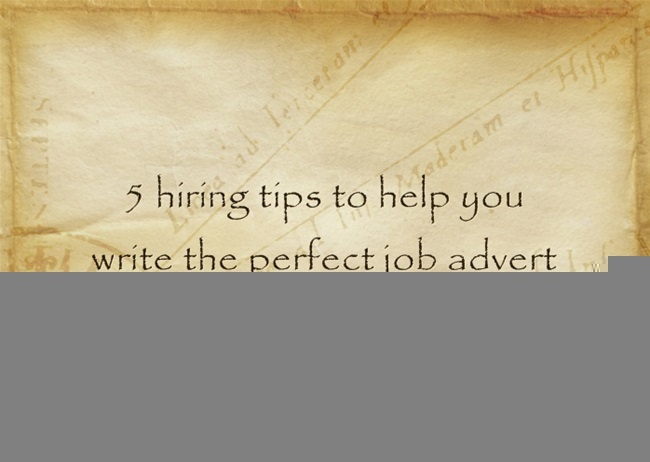 If you want to know how to write the perfect job advert for your company, you must first be tuned into the Pros and Cons of working within your business. What are the genuine strengths of your company and the career path and culture it can offer to employees? Just as importantly, what are its shortcomings? To attract the most suitable employees for your business, it's critical that your job advert conveys both the upsides and the shortcomings of a career in your company. Otherwise you will attract dream candidates who are left disappointed by the realities of their interview experiences (or worse still, their first weeks on the job) - and who will not be pursuing a career with your company a year from now. 1. Use Commonly Accepted Job Titles. In the main job title field of your advert - the one that is going to appear in search results and as the main bold title of your advert - drop your company job title in favour of the title that would most commonly be used within your industry. This ensures you appear within more search results - and increases the likelihood that suitable candidates will click through on your advert. By all means reference the company-specific job title within the body of the advert, but lead with one that your ideal candidates will relate to (and search for). 2. State the Salary. There are times when it is just not possible for a recruiter to put a salary on a job advert. But every time you post a job, you should be asking yourself if you can state the salary - or at the very least, state a meaningful range the role would pay. Stating a salary helps candidates to self-select whether the role is appropriate for them or not. Plus it can solidify a candidate's decision to want to apply for the role. I mean how many successful business people are really going to want to craft tailored applications for roles if they don't even know that the pay on offer will be acceptable? Omitting the salary just encourages applications from the more desperate job seekers and fails to solidify the decision of strong candidates to apply. 3. Lead with the Pros and Cons of the Role. Do you know what the most likely course of action is 5-10 seconds after a candidate starts reading a job advert? The most likely outcome is that they hit the "back" button and go off to look at the adverts of your competitors! Just as Recruiters make quick decisions about Resumes that aren't worth looking at, so candidates do the same with job adverts. Your primary goal with the first lines of your advert should therefore be to ensure that suitable candidates are excited by the opportunity and want to read the rest of the advert. In part this involves selling the most compelling aspects of the opportunity ("entrepreneurial types will thrive in our fast-paced start-up environment and will be rewarded with a stake in the business"); but it also involves qualifying who suitable candidates are, so that those who are unsuitable are deterred from reading further ("... whilst our culture sees us frown upon long working hours, the need to travel overseas in this role will mean it is not for everyone"). It is this frankness about Pros and Cons of the role that helps ensure the most suitable candidates will go on to apply. 4. Keep it Short. Most job search activity continues to take place during office hours or from a mobile device. Your candidates are therefore time-pressured at the times they are browsing for openings and your adverts should be made correspondingly shorter. Company information, in particular, is often the culprit when job listings become overly long. 5. Only State Must-Haves. Please pay particular attention to this! Often you'll see recruiters copy and paste from their internal job description the "Key Requirements" or "Desired Candidate Profile" bullet points list. This is essentially a wish-list that comprises everything your colleagues' dream candidate would be able to offer. Here's the problem with that. Strong candidates don't like being rejected. Strong candidates will choose not to apply to roles where they think there's a danger of them being rejected. Strong candidates will focus on applying to roles where they can tick all the "must have" criteria... and aren't given any reason to doubt that they are a strong candidate for the role. Consequently, your bullet point list of candidate requirements should ONLY contain must-have criteria. It should list only those things that the business would not be willing to compromise over in making the hire. Anything else - any nice-to-haves - will just be a deterrent to strong candidates. Omit. Completely. So there you have my hiring tips on how to write the perfect job advert. There are more ideas I could share, but get the above points right and you'll already be way ahead of your competition! Of course, if you'd like to become less reliant on job adverts and leverage social recruiting more effectively instead - we'd be happy to arrange a call!